Hungryman anchorage is little used, which makes it a favorite of ours. Hungryman Gulch is just south of Pt. 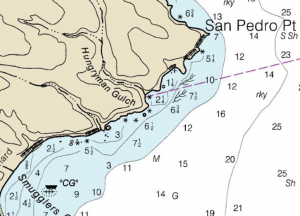 San Pedro in the vicinity of “White Rock,” as it is labeled on the plastic charts. You rarely see boats anchored there, especially after dark, as this spot is not nearly as well protected as Smugglers or Yellowbanks, which are just a couple of miles south. Yet we’ve had a hankering to go in there for years and finally did so on one of our painting expeditions with David Gallup a couple of years back. It’s tempting to snuggle up in there on bow and stern hook just to the south of the small peninsula, but there is no good reason to do that. The prevailing wind comes from the west and getting close to a northern wall doesn’t add to your protection. The protection is from the island itself and that protection is available almost anywhere along the high bluffs. If you look carefully at the picture of the anchorage, you’ll see a small, moored sailboat. That’s about the same spot where we shot the video and were moored for the painting below. There is no need to anchor so close to the small peninsula, unless you’re painting a picture. Anywhere along this stretch of coast gives some protection from west wind and swell, though anchoring immediately at the foot of Hungryman Gulch invites heavy winds. 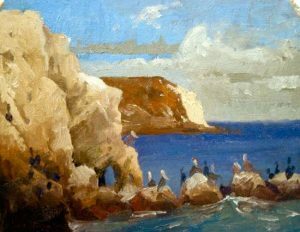 David Gallop: Paintings from Santa Cruz expedition November 2009. We anchored there overnight in the fall, positioning ourselves seaward of White Rock and roughly midway between that and Hungryman Gulch in about 35 ft. of water. Zoom in on the chart at the top to get yourself oriented. We encountered no kelp and had no trouble setting the anchor. We encountered no rocks, though the previous kelp growth would indicate that the bottom is not entirely sand. There are some interesting currents circulating around Pt. San Pedro, but we were south of the small Potato Patch and just swapped directions as the tide shifted from flood to ebb. We have frequently kayaked the coastline from Prisoners to Yellowbanks. This segment is particularly nice to paddle in the afternoon, when it’s too much work to paddle the north shore. There are a couple of reefs here, so keep looking forward for the breaking water. Water clarity tends to be very good here and on smooth mornings it’s like paddling through an aquarium. A friend of our recently reported that his anchor lodged among rocks at Hungryman. The water was extremely clear and he could see the anchor and the rocks. I guess we’ve been lucky up to this point. When we go in here again, we’ll likely rig a trip line. The final hazard is self-created – anchoring in too close. 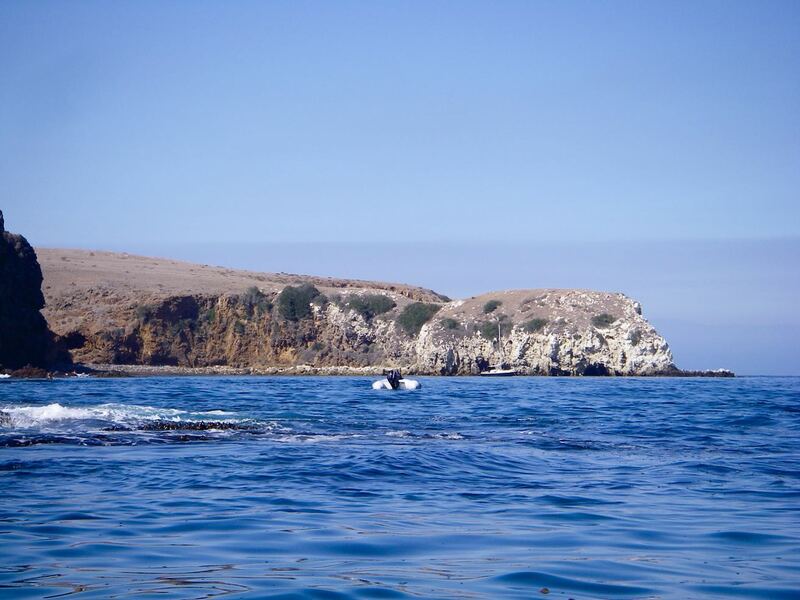 It is tempting to try to get inside the cove, but the protection is not much improved and even a modest size boat needs more rode than one can safely veer out due to the close quarters. The wind comes from the west and the swell can come from anywhere but the west, so snuggling in close to the beach doesn’t do much for you. There is a fair amount of traffic that travels close aboard Pt. San Pedro in bound to Smugglers. This would be a very bad spot to forget your anchor light.